Parish Minister: Sr. Joan Riedley, O.S.U.M.S.J. Sundays — Sat evening, 4 p.m.; Sun: 9 a.m., 11 a.m.
Daily — Tues–Fri: 8 a.m.
Saturdays — 3:00 p.m.-3:45 p.m.
St. Helen was established in 1897. The first pastor, appointed on October 2, 1897, was Father John Baptist Peifer, a German immigrant. Along with his appointment to St. Helen, he was given charge of St. Andrew near Pleasure Ridge Park. In 1897, the first rectory and school were built. Part of the school served as the church. Five years later, the Ursuline Sisters of Louisville began teaching, traveling daily by railroad and streetcar until 1912, when a convent was provided. Thus began the history of St. Helen Parish on Dixie Highway. In 1923, the old frame schoolhouse was moved back and converted to a convent. The original convent was then sold, and the present brick school was built on its site. In 1935 seating in the church was increased to 600, and in 1938, Father Peifer retired after forty-one years of service. Father Joseph A. Newman then served for nineteen years. He exercised civic influence in the Shively area as well as penning a Catechism used by many in the Archdiocese. 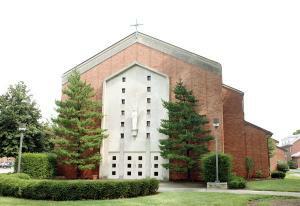 The present church was built by Father Bernard Spoelker in 1962, and it was updated by his successor, Father Gerald Timmel in 1986. In 2004, St. Helen School joined with St. Lawrence School and St. Denis School to form Notre Dame Academy. Now merged with Saint Denis and Saint Matthias to form Mary Queen of Peace, the parish continues to fulfill the role of service to the church and community. This is shown by the parishioners’ service to such efforts as Shively Area Ministries, support for Notre Dame Academy, and a firm commitment to stewardship. Mary Queen of Peace cares for the needs of its parishioners as well as the archdiocesan community by the example of reaching the Catholic Services Appeal goal for the past twelve years. Mary Queen of Peace continues, caring and serving into the future.